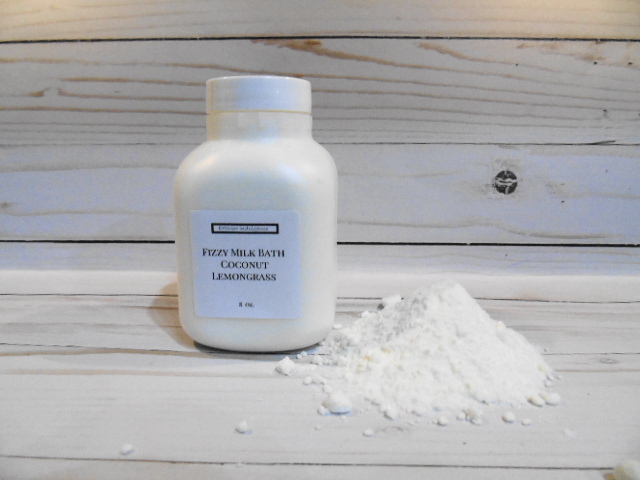 Products / Fizzy Milk Bath 8oz. Two worlds collide in this milk bath like no other! A both bomb and a milk bath share the spotlight and deliver a powerful punch. Loaded with skin loving oils, 2 different moisturizing milks and the ultimate moisturizer...honey! Indulge yourself with this one of a kind skin softening treat for your bath. Please Include your fragrance choice in the notes at checkout. Jamaiican Me Crazy: Exotic tropical vacation, a strong blend, full of wild fruits, papaya, coconuts, bananas, mangos and more Clean Fresh Linen: Crisp and freshly washed linen fragrance Lime in da Coconut:This fragrance will whisk you away to clean tropical islands. A harmonious blend of Coconut, Lime and aromatic Verbena Champagne: The is a slightly sweet, effervescent fragrance Blazing Blueberry: A true blueberry fragrance, sweet and juicy with a just a hint of tartness Beach Daisy: A clean water with hints of fresh bloomed Daisies Heaven: A beautiful blend of soft florals with soft musk notes Amber: Woodsy, warm and mysterious, with a hint of the orient Amber & Vanilla: A sensual, soft scent Coconut & Lemongrass: Base note of coconut blended with a zesty blend of lemongrass and pineapple with middle notes of Peach and Lily of the valley followed by warm notes of sandalwood Chamomile: The ultimate fragrance for relaxation! The calming, hypnotic scent of the chamomile flower will instantly melt your tensions away Ingredients Sodium Bicarbonate, Citric Acid, Buttermilk Powder, Dendritic Salts, Corn Starch, Sesame Seed Oil, Honey Powder, Rice Bran Oil, Jojoba Oil, Apricot Kernel Oil, Sweet Almond Oil, Fragrance.